I love surprises. For other people anyway…not so much for me. This year for our twelfth wedding anniversary I told my husband to pack for a romantic getaway without the kids, but I wouldn’t tell him where we were headed. Slowly, I doled out clues to him (and you!) via the Travel Mamas Facebook page. After a couple of days and plenty of guesses, I finally revealed our destination: Monterey and Carmel along California’s central coast. 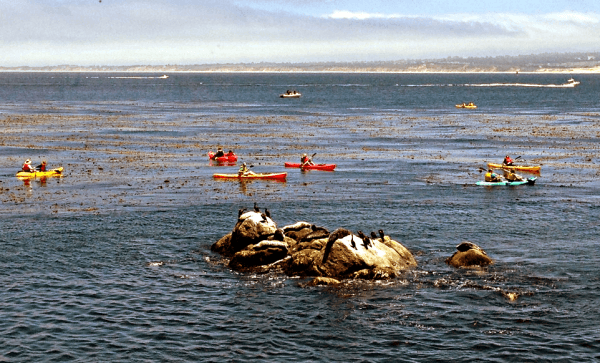 There are just four miles separating Monterey from its equally visit-worthy neighbor, Carmel.In comparison, Monterey is more bustling, but only slightly. 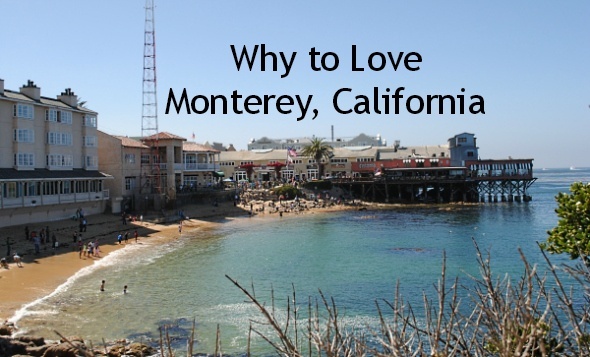 In New Monterey, you’ll find Cannery Row, which is also the name of the area’s main street. Here you’ll find restaurant options aplenty as well touristy shops at which you can purchase kitschy souvenirs and t-shirts. Made famous by John Steinbeck’s book, Cannery Row, Monterey pays tribute to the sardine factory workers who toiled here from 1908 until the last cannery closed in 1973. Be sure to walk through a wee park above the main strip with its replica immigrant houses from the sardine heyday of the early 1900s; it’s also a nice spot to relax in the shade of trees and spy on butterflies for a bit. The main draw in Monterey is its famed aquarium. The Monterey Bay Aquarium is one of the best (if not THE best) I have ever visited. Both kids and parents will appreciate the aquarium’s hands-on, educational displays. In addition to a vast array of fish, the sea otters are a non-stop swirling, swimming, diving frenzy of fun. The resident penguins are less active but intriguing as well. 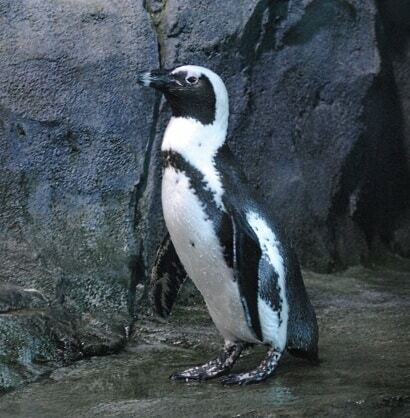 I watched one tuxedoed gal waddle about and ponder diving into her exhibit’s chilly waters for a full 15 minutes before I gave up capturing a penguin-dive action shot. 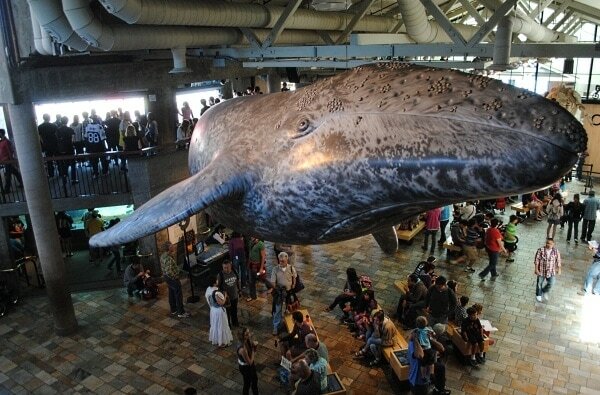 The Monterey Bay Aquarium is very busy and rightfully so. I highly recommend purchasing your aquarium tickets before arrival to avoid standing in a ridiculously long line, especially during high travel season (like summer weekends). Plan to spend a little dough on educational and fun items for the kiddos at one of the attractions impressive gift shops. The aquarium’s sit-down restaurant, Cindy’s Waterfront, boasts one of the best ocean view in town and came highly recommended to us. For a similar menu at cheaper prices, you can dine at the aquarium’s cafeteria-style cafe instead. While Cindy’s view was stunning, if it’s a bowl of the town’s best clam chowder you’re after, I must recommend the Fish Hopper or its sister property, Old Fisherman’s Grotto, instead. I never had been much of a clam chowder lover, but after a sample of their tasty soup, I have become a convert! While you can easily drive 10 minutes or so to reach Carmel from Monterey on public roads, you must at some point during your stay embark on the famous 17-mile Drive. This winding private oceanfront road charges a nominal fee but it’s well worth the views. Plan to stop a lot along the way to snap shots of the rocky ocean cliffs and sandy beaches frosted with plumes of misty clouds. 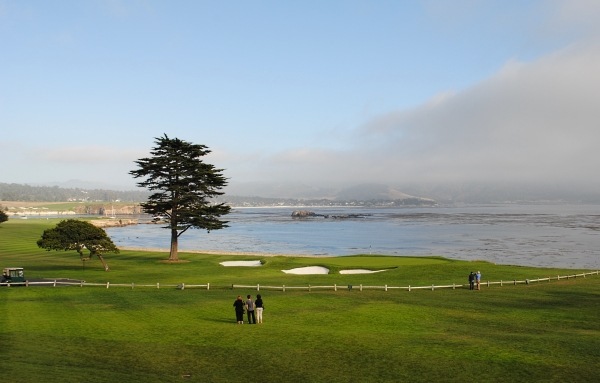 Top off your drive with a stop at Pebble Beach Golf Club. If you love golf and have deep pockets, make a reservation to hit the links one day during your trip. Or, do as my husband and I did, and live the rich life vicariously by sipping cocktails served overlooking a magnificent stretch of grass and ocean. 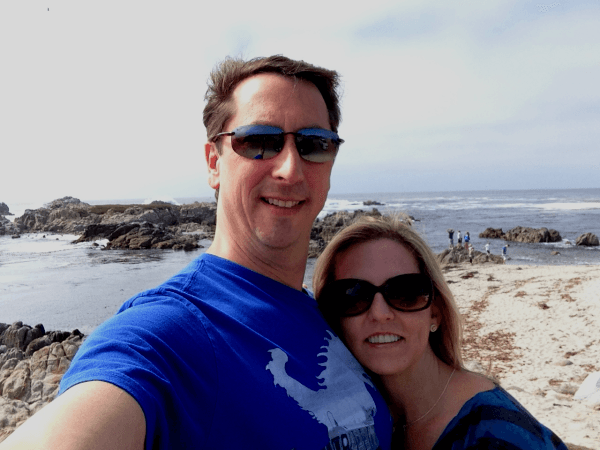 So, what did my husband think of my choice of Monterey and Carmel for our romantic getaway? He said, “I think it was perfect. It was just what the doctor ordered.” Well, I’m no doctor, but I couldn’t agree more! For more to do and see nearby including hiking, shopping, wine tasting, dining and beyond…check out Sigh-worthy Romantic Getaway to Carmel. A Note from The Travel Mama: We received complimentary passes to the Monterey Bay Aquarium for review purposes. All opinions are my own, as always. I lived in Monterey for 2 1/2 years. Spectacular place. and great choice for surprise anniversary getaway. A correction to your Monterey info. Cannery Row is in an area called New Monterey. Downtown Monterey is distinct and about a mile and a half southeast. The Presidio separates New Monterey from (old) Monterey. The area certainly has fantastic clam chowder. Best I have ever had is from Vivolos, a block from the aquarium. In fact, one of my favorite things (in the whole world) is watching the sunset from Ocean View Drive with take out Vivolos clam chowder in a sourdough bread bowl. Take care. Wonderful write up. This does all look lovely. I drove along the 17-mile drive a few years ago with a friend and when we stopped to take photos our rental car wouldn’t start! There was nobody else around and we panicked a bit, didn’t know what to do at all and then it magically started, much to our relief. Mums do travel – So glad it all worked out OK! There are less attractive places in the world to be stranded tough for sure! Dmitry – Thanks for your comment! It was cloudy most days when we were in the area too, but the clouds add to the scenery in a way. First of all i would like to wish you a very auspicious Anniversary …and thanks a lot for giving me an idea about my wedding anniversary coming on 11th. as usual I enjoyed your post very much thanks a lot for sharing.